In summer with regular use, your BBQ gets filthy and unhygienic, give us a call today for professional BBQ cleaning. Thanks for visiting High Wycombe Oven Cleaning for professional cleaning of ovens in the High Wycombe area. We are a family run oven cleaning company based near High Wycombe covering the High Wycombe area including Lane End, Handy Cross, Little Marlow, Loudwater, Flakwell Heath, Penn, Forty Green, Winchmoor Hill, Coleshill, Woodrow, Mop End, Hazlemere, Downley and West Wycombe. Locally based near High Wycombe, we offer professional, affordable, eco friendly oven cleaning in High Wycombe and the surrounding area. We are a local oven cleaning company with an outstanding reputation for quality, value, professionalism and outstanding customer care. Fully trained by the Dirtbusters Network you can be assured of fantastic results every time. Get a free quote today. Our oven cleaning prices are always competitive and offer great value for money. We'll have your oven looking as good as new in no time so why not give us a call today on 01494 809599. As a family run business we pride ourselves on offering a reliable, affordable & fully insured oven cleaning service in the High Wycombe area including Lane End, Handy Cross, Little Marlow, Loudwater, Flakwell Heath, Penn, Forty Green, Winchmoor Hill, Coleshill, Woodrow, Mop End, Hazlemere, Downley and West Wycombe. Get an oven cleaning quote online or call 01494 809599 for an instant oven cleaning quote. 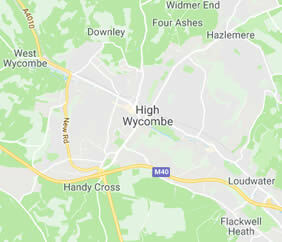 If you are looking for professional, fully insured and reliable oven cleaners in the High Wycombe area contact High Wycombe Oven Cleaning today!